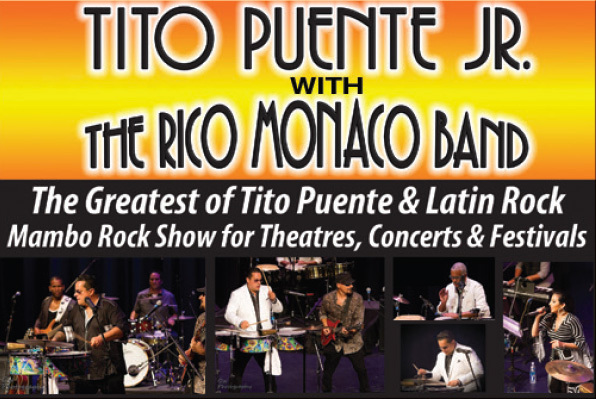 Tito Puente Jr. with The Rico Monaco Band – The great Tito Puente Jr, along with international sensation, The Rico Monaco Band bring a concert of hits from Tito Puente, Santana, Juanes and all of the Latin Rock Legends to your stage. See why Sammy Hagar personally selected this show to win the Hard Rock/Cabo Wabo National Battle of the Bands and why he regularly jams with The Rico Monaco Band. This amazing show is a hit everywhere it plays from Paris to New York to San Francisco, Miami and beyond.